Kicking things off, Dan takes a look at the party dude known as Michelangelo! Nice review. Did you get the retro/classics ones that were recently released too?? THOSE look awesome! I did! I'll have a review for them up this week as well! LOTS of TMNT reviews are coming! Great review as always! Would you give any thought to customizing the weapons? Essentially I just mean painting them? And question for the future…so I'm pretty sure you'll have "comparison time" once you get the classic line but once you do just curious how the classics weapons look with these figure. probably off scale. I might consider painting them someday. I have the Classics as well, and will have that review up soon! The weapons are much bigger and will probably be too big for these guys, but I'll check! I actually did go through and customize the weapons on all the turtles. A little silver and gold gloss enamel paint and paint hardener to make sure they dont chip and they look cartoon accurate. 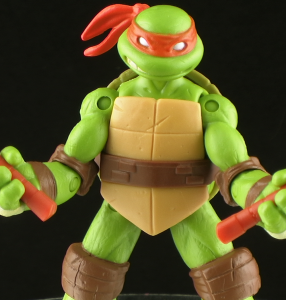 I even went as far as putting actual chains on Mikey's nunchucks and other weapons so they look good. Very nice review, Dan. And loved intro for TMNT's review. By the way. Games Workshop's Citadel Paints are just good for painting almost any toys including these Turtle's weapons. Thanks! And yep, I have a stash of Games Workshop paints. 😀 So I may end up painting these guys at some point. But even with unpainted weapons, I can't deny how fun these figures are! Love them! Thanks Dan……..Now bring on that MASSIVE playset!!! ?……….Can not wait! These figures look a lot better than I thought they would. The one weapon is a chain and sickle. The Japanese name for it is kusarigama. Looking forward to the new cartoon this fall!! !